Thomas of Aquin or Aquino, was an Italian Dominican friar and priest and an immensely influential philosopher and theologian in the tradition of scholasticism, within which he is also known as the "Doctor Angelicus", "Doctor Communis", and "Doctor Universalis". "Aquinas" is from the county of Aquino, an area his family held land in until 1137. He was born in Roccasecca, Italy. Thomas Aquinas is currently considered a "single author." If one or more works are by a distinct, homonymous authors, go ahead and split the author. 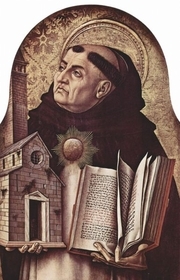 Thomas Aquinas is composed of 106 names. You can examine and separate out names.